Some dogs just love exploring puddles, rolling around in garbage, and can’t resist excrement from other animals. Getting messy is in their nature, which is why baths are an essential part of dog care. Experts recommend not washing your dog too frequently, as doing so can strip his skin and coat from natural oils that are meant to protect them; however, when your pooch is covered in muck and the smell coming off of him is too much to bear, a bath is an absolute must. Below, we share the five best natural shampoos that are specially formulated just for dogs. Using a high-quality shampoo for your dog is vital. Many dogs have sensitive skin and could react negatively to harsh ingredients that some products contain. Plus, you want to ensure that you aren’t damaging the natural oils that their skin produces. In this guide, we offer five dog shampoos that will cut through the dirt, debris, and smells that your dog can pick up, yet won’t damage their skin or coat. 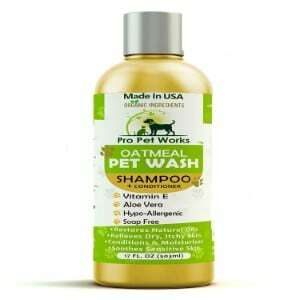 This vet-recommended, all-natural shampoo is a 2-in-1 formula that is specially formulated for sensitive skin. It’s American made and completely free of harsh chemicals and other additives. This shampoo is completely free of ingredients that can be harsh on sensitive skin, like alcohol, sulfates, dues, and perfumes. Instead, this pH balanced formula is contains all-natural ingredients that are intended to nourish sensitive skin and preserve and even regenerate the vital oils your dog’s skin naturally produces. Your furry companion is more than just a pet; he’s a member of your family. You want the absolute best for him, and when it comes to a shampoo, Pro Pet Works Natural Dog Shampoo and Conditioner definitely won’t disappoint. We’ve seen, first-hand, the damage that some shampoos can cause. Harsh chemicals, such as sulfates, dyes, alcohol, and perfumes, can seriously irritate the skin, causing dry, scaly patches, and drying out the fur. That’s not the case with Pro Pet Works Natural Dog Shampoo and Conditioner. We tested it on several dogs who were covered from head-to-toe in dirt and who are prone to allergies, and we couldn’t believe the results! Not only did this shampoo cut through all of the muck and eliminate the smell, but there were absolutely no adverse reactions to their skin, and their coats were so shiny and easy to comb! Conclusion: This shampoo will not only meet your expectations; it will exceed them! 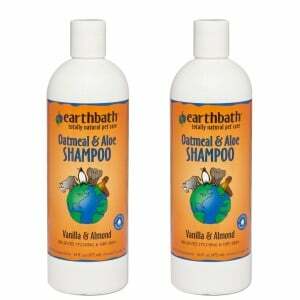 Next up on our list of the best shampoos for dogs is Earthbath All Natural Pet Shampoo. If your furry companion has sensitive skin and other shampoos have caused irritation or just haven’t been able to really clean him, we strongly suggest you try Earthbath. This shampoo is made of all-natural, organic ingredients, like aloe vera and oatmeal, and it’s formulated to address the unique needs of dogs that suffer from dry, itchy skin. This formula is pH balanced to cleanse and deodorize while nourishing and moisturizing Fido’s skin and coat. While it will wash off even the toughest dirt, it won’t remove any topical flea control products you’ve applied. Eartbath is committed to making high-quality products that are safe for your dog and good for the environment, too. This shampoo is 100% biodegradable, so if minimizing your carbon footprint is important, this shampoo will offer you peace of mind. Available in a variety of unique, natural blends, such as aloe and oatmeal, tea tree oil and aloe, eucalyptus and peppermint, and awapuhi and green tea, you’ll be able to find a formula that will work for you and your pup. There’s even a coat brightening formula! Conclusion: Made with your dog’s health and well-being in mind, as well as the health and well-being of the planet, Eartbath All Natural Pet Shampoo is a real winner! Fieldworks Moosh Natural Dog Shampoo is another top-pick for pooches that have sensitive skin, yet love to roll around in mud and muck. What really makes this shampoo unique is that it is antibacterial and antifungal, which means that not only is it non-irritating, but it can also help to great and prevent bacterial and fungal infections. As if that wasn’t enough, this formula offers antiseptic properties, too! Fieldworks Moosh is specially formulated for sensitive skin. It contains only the highest quality ingredients that offer soothing, moisturizing, and healing properties, such as neem oil, argan oil, nutmeg, vetiver, and rosemary. It also features bentonite clay, a natural ingredient that cuts through dirt and keeps pests, like fleas and ticks, away. Fieldworks Moosh isn’t just good for your four-legged family member; it’s also good for the environment! It contains no harsh chemicals, additives, sulfates, or preservatives, which is amazing for your pup; but it’s also great for the planet! This formula is completely biodegradable, so you’ll reduce your carbon footprint and keep Fido clean! Conclusion: Made from all-natural ingredients that treat and sooth sensitive skin and infections, and leaves your dog incredibly clean and shiny, we give Fieldworks Moosh two thumbs up! If your furry companion has long hair that’s hard gets matted and tangled, if you have a puppy, or if your pooch has sensitive skin, you’re going to love Wahl Four-in-One Dog and Puppy Shampoo. 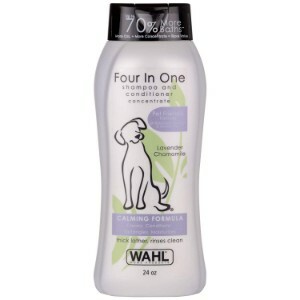 Wahl’s Four in One Dog and Puppy Shampoo contains the lavender and chamomile. The lavender will remove even the smelliest odors, so if your pooch likes to get into garbage, excrement, or anything else that stinks, this shampoo will leave refresh your pup’s coat and make him smell delightful. Chamomile offers soothing properties, which makes this shampoo a great choice for dogs of all ages – including puppies – that are prone to sensitive skin. All ingredients are plant-based, so you will have peace of mind knowing that you aren’t putting anything hash or dangerous on your dog. It’s completely free of PEG-80, a harmful chemical that many dog shampoos contain. Wahl’s Four in One Shampoo is made to cleanse your dog, removing even the toughest dirt with ease. There’s no need for vigorous scrubbing; just apply a small amount to your pup’s coat, gently massage, and watch that dirt and smell that odor wash away. Plus, it contains conditioning properties that will leave your puppy pal silky and smooth. You’ll have no trouble passing a comb or a brush through his coat! And, since it’s so gentle, it won’t irritate your dog’s skin or cause any other adverse reactions. Talk about making bath time a breeze! Some users have complained that they were not pleased with the scent, but we have spoken to dozens of people who say they thoroughly enjoy the aroma. With that said, we believe that everyone’s sense of smell is different, which is likely the reason why some people weren’t pleased with the aroma. Conclusion: Affordable, easy to use, and nourishing; this shampoo has it all! 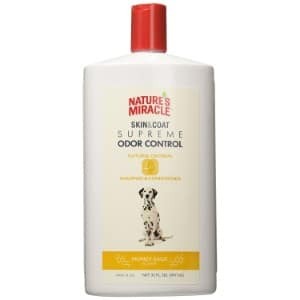 Last but certainly not least on our list of the best dog shampoos is Nature’s Miracle Supreme Odor Control Natural Oatmeal Shampoo and Conditioner. If your dog loves to get into smelly mischief and he has sensitive skin, then this is the shampoo that you are going to want to use. 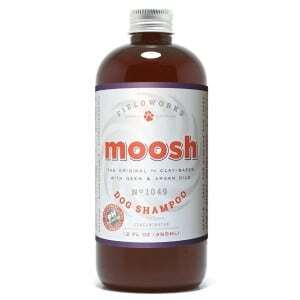 This shampoo is specially formulated to cut through even the most pungent odors, including fox urine and skunk! In fact, it’s so effective at neutralizing odors that it can literally eliminate them on contact! We know, because we tested it on a few dogs that had gotten into some serious smelly trouble, and we were completely floored by the results! What’s the secret? – It is specially formulated to form an odor control complex, thanks to the high-quality ingredients that are specifically designed to target and eliminate tough odors. Not only you’re your dog smell clean right when he gets out of the bath, but he’ll smell fresh for days to come! This shampoo offers long-term odor control and replaces those foul smells with a delightful honey and sage scent. You’ll love cuddling up with your pooch when you bathe him with Nature’s Miracle! In addition to control odors, Nature’s Miracle soothes and hydrates. This formula is free of dyes, parabens, and other harsh chemicals that can aggravate the skin. It contains natural oatmeal that sooths and hydrates the skin, so you can say goodbye to dry, flaky, and itchy skin. You’ll also love that it’s a soap-free formula, which makes it safe to use with topical flea and tick control products. And, it will also leave your dog’s hair incredibly soft, exceptionally clean, and it even reduces static electricity! Talk about an incredible shampoo! Some users complained that it did not offer any conditioning properties; however, we did speak to countless people who said that it left their pup’s hair shiny and easy to manage, so the complaints could be due to improper grooming techniques post-bath. Conclusion: If your dog is super stinky, this shampoo is the solution you’ve been searching for! In order to ensure your dog is as comfortable, healthy, and safe as possible, there are certainly supplies that you absolutely need to have on hand. A dog crate and dog bed are absolute musts; and depending on your dog’s lifestyle, so is a dog playpen, dog house, and an outdoor kennel. There’s another must-have product that you’re going to need to have for your dog too, and that’s shampoo. Selecting a shampoo for a dog might not seem like a difficult task. Many dog owners just walk into the store and buy the one that’s the least expensive, or one that has a pleasant smell. Some people don’t even think that using a shampoo that’s made specifically for dogs is necessary, and instead, they use human products. It’s easy to understand why so many people don’t put too much effort – if any – into selecting shampoo for their dogs; if it says “shampoo” on the label, it’s going to clean a dog, right? Sure, any shampoo can remove dirt, but it might not do an efficient dog. Plus, the skin of a dog is unique and many are prone to allergies or are easily irritated by certain chemicals. For these reasons, it’s important to ensure that you are using a shampoo that is specially formulated for your dog’s unique needs. Speak to any veterinarian or dog groomer and they will tell you that using a high-quality shampoo that’s made specifically for dogs is imperative. But there are so many shampoos on the market that it can be hard to decide which one to use. While having a lot of options is a good thing, it can make it difficult to determine what is actually safe for your pup and what to should steer clear from. In order to help you select the best shampoo for your dog, we’ve put together this handy buyer’s guide. It’s filled with invaluable information, including why you should never use human products on a dog, and what you should look for in dog shampoos. After going through this guide, you’ll be able to pick the best shampoo for your family’s furriest member. When it comes to dog shampoos, one type does not fit all. Just like you would feed a Great Dane food for large dogs or a Yorkie food for small dogs, you should choose a dog shampoo that will work for your furry friend’s unique needs. How do you know which type of shampoo to use? Use common knowledge and think about your dog’s needs. For example, if your pup has (unfortunately) picked up fleas, instead of using a flea collar, you could use a shampoo that’s formulated to combat these pests as well as essential oils for dog fleas to control the problem. If your dog has sensitive skin, using a medicated shampoo in conjunction with coconut oil for dogs and feeding him dog food for allergies could help to soothe his skin and improve the condition of both his skin and coat. Or, if your four-legged family member has a long coat, using a shampoo detangling shampoo will make passing a dog brush through his hair a lot easier. Your dog’s skin products sebum (oil) that are meant to protect their skin and coat, and keep it moisturized. As mentioned, using a human shampoo to wash your dog can strip your dog of those oils and damage his skin. Furthermore, there are many dog shampoos on the market that contain harsh chemicals that can also damage your dog’s skin; especially if your furry friend is prone to allergies. A high-quality dog shampoo will be specially formulated to work with the unique pH level of a dog’s skin. It shouldn’t be too acidic, but rather more alkaline. A reputable shampoo will also contain natural ingredients and it will be completely devoid of harsh chemicals and additives, such as perfumes, dyes, and sulfates. The best shampoos for dogs will also remove dirt and debris with ease, rinse out easily, and cut through tough odors. They’ll also leave your dogs coat shiny and easy to manage. All of the shampoos that we’ve listed in our guide achieve the above-mentioned goals. They’re formulated for a dog’s sensitive skin, are made of natural ingredients, are easy to use, and leave the coat shiny, easy to manage, and smelling fresh and clean! Natural ingredients. Both veterinarians and dog groomers agree that the best shampoos for dogs are comprised of natural ingredients. Each of the shampoos on our list feature all-natural ingredients, such as aloe vera, chamomile, and lavender, and essential oils. Vets recommend natural ingredients because they are much milder and there’s less of a chance that they will irritate a dog’s sensitive skin; hence the reason why we chose the shampoos on our list. Free of harsh chemicals. Vets and groomers also stated that dog owners should avoid using shampoos that contain harsh chemicals, such as phosphates, dyes, and alcohol. As mentioned, all dogs have some degree of skin sensitivity, as their skin is more alkaline. Dog shampoos that contain these ingredients are more acidic, and thus, they are more likely to cause irritations. Each one of the shampoos on our list are free of harsh chemicals, so you will have peace of mind knowing that your dog’s skin will be in good health. Dog shampoos should also contain ingredients that are proven to condition both a dog’s skin and coat and won’t strip their skin of natural oils. The dog shampoos mentioned above all contain ingredients that are meant to condition both the skin and the coat, improving the health of both. Odor cutting power. Lastly, vets and groomers told us that the best dog shampoos have the ability to combat pungent odors; because, let’s face it: dogs can get pretty stinky. All of our picks for dog shampoos have been proven to remove even the harshest odors, like garbage and excrement, and leave pups smell clean and fresh for days after they have been bathed. When it comes to shampoo for dogs, there are a lot of options available; however, not all of them are formulated for a dog’s sensitive skin. If you want to ensure that your pup is getting the best possible washing without damaging his skin or coat, you’ll definitely want to choose one of the five options mentioned in this guide.